The project was handed out by Mäster, a Swedish brand that specialises in paint brushes and is part of the Alfort & Cronholm’s concern. The design team for this project consisted of Tony Larsson, Bjanka Colic, Jennifer Hansen and Rebecka Chiu. 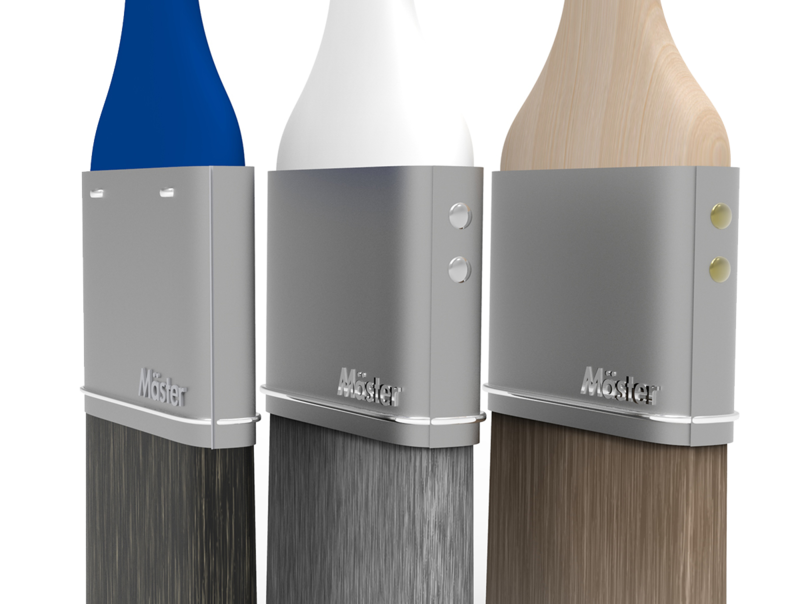 Today Mäster has a vast product portfolio with many types of brushes and quality levels so that they can appeal to a large portion of the market. The origin for the assignment was that the people at Mäster felt that over time their product portfolio had become hard to navigate for the customers. There were two main reasons identified for this: an incoherent design language, and a logic for differentiating different quality levels that was hard to understand for the customer. To remedy the second problem Mäster hired an external marketing company to come up with a strategy for differentiating the different levels of quality. The solution they came up with was creating three different tiers named: Guld, Silver and Brons (Gold, Silver, Bronze in Swedish). Based on those three quality levels they also designed a new packaging for the brushes. The task for our design team was to create a portfolio strategy and design guidelines for the Mäster brand using the Brons, Silver, Guld differentiation between quality levels as a starting point. Which user segments goes for which levels of quality? How do people use their brushes? What is the essence of the Mäster brand? The research was carried out by visiting stores, talking to customers and employees, looking at the inventory of different stores, and by researching online. Research revealed that the customer base could be divided in three customer segments: The Professional, The Do-it-yourselfer, and the Non-engaged customer. The professional works with brushes as a part of his job so this customer knows exactly what he needs to get the results he wants. The professional usually goes for higher tier brushes as he looks for the best result and knows that higher tier brushes will last him longer if he takes good care of them. When buying brushes the professional associates a blue top with the Mäster brand. To them the brand represents quality, knowledge and traditions. The Do-it-yourselfer is an amateur painter that likes to paint and looks for a good result but does not always know how to achieve it. Depending on the do-it-yourselfers commitment to a particular project and his or her financial situation this customer might buy from different higher quality tiers of brushes. 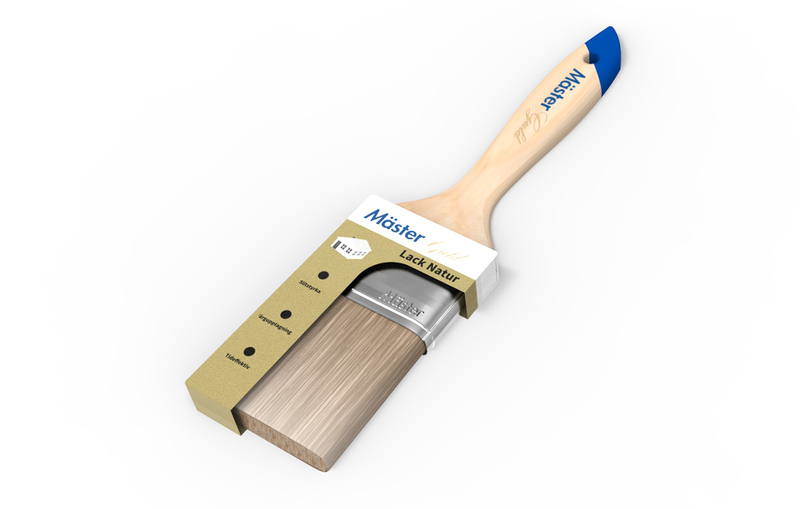 This customer segment has a vague perception of paint brush brands in general and few know of Mäster. For those that do know Mäster their strongest association to the brand is the color blue. The non-engaged customer does not care about the brush and sees it as a throwaway product. This customer will use it only once and is therefore simply looking for the cheapest alternative on the market. 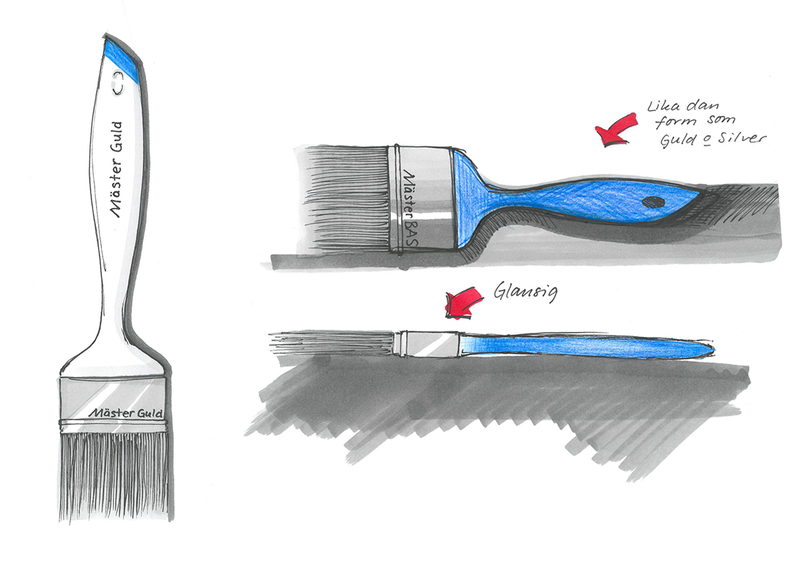 There is an underserved customer segment of those that see the paint brush as a throwaway product. 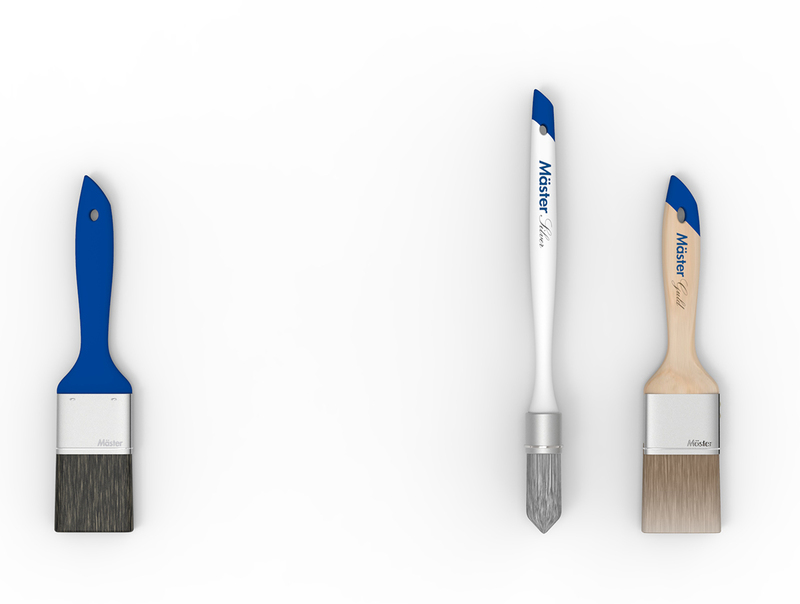 The strongest associations the Mäster brand has are quality, knowledge, tradition and the color blue. The brand is not well known outside of the professional customer segment. By improving the coherency and look of the product portfolio, and emphasising personal elements in the design, the non-engaged user segment can be diminished in size as more people start to care for what brush they choose, thus moving away from the cheapest alternative. For those that still do not want anything more than the cheapest alternative a new lower price tier will be created called BAS (Basic in Swedish). Adding this new tier also means that the Brons tier will be removed. The reason for this is that it does not serve any particular market segment. The Professional goes for the higher quality levels and the Do-it-yourselfer that used to buy Brons might as well be satisfied with Silver as the gap in quality is not very large. The new BAS quality level will be clearly separated from the Guld and Silver tier so that the perception of quality for those tiers does not suffer. Capitalising on the association that the Mäster brand has to the color blue, a sideway cut blue top will be added across the product portfolio. This feature can be implemented across all different types of brushes as the top will never be crucial to the functionality of a brush. The handles of the Guld and Silver brushes will be adorned with a text that signifies which tier the brush belongs to. 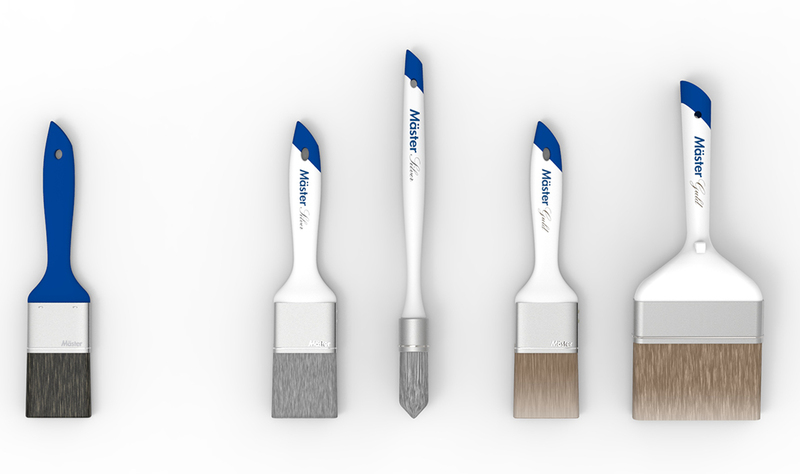 The BAS quality level will not have the text but instead be coloured completely blue to signal its lower price and to distance itself from the premium Mäster brushes. All of the brushes whose functionality allows for will have a similar silhouette going out in the middle of the handle and then coming back in towards the top. The BAS quality level will have this silhouette also, but seen from the side it will be flatter to signal that it is not as ergonomic as the premium brushes, further underlining its lower price (and simplifying manufacturing). Where possible the metal band of the brush will use side cuffs, drawing parallels to those you find on shirt arms. 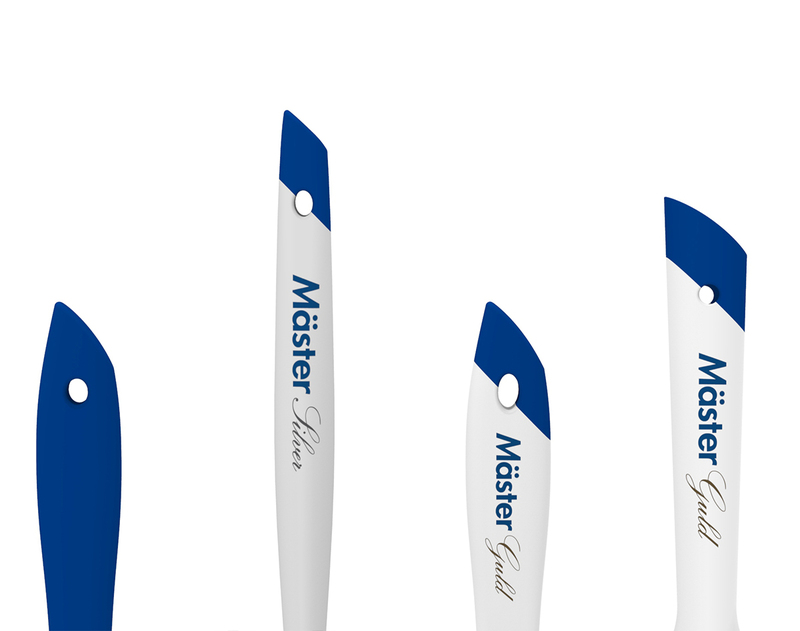 This elegant technical solution will increase the personal attachment a user feels towards the brush and also emphasise the knowledge aspect of the Mäster brand. The colour of the cuff will represent the quality tier of the brush and the BAS level will not use these side cuffs but the regular stapling method of attaching the band instead. On the front of the metal band the Mäster logo will be embossed asymmetrically, mirroring the asymmetric cut of the top. For rigidity a groove will be added near the bottom of the metal band. This will have the added effect of underlining the Mäster logo. The brush hairs will have different colours to help user differentiate between the brushes. The Silver brushes will have silver coloured hairs and the Guld brushes will have them gold coloured. The BAS level will use simple black synthetic hairs. For the changes in the metal band to be seen by customers in the store a new packaging had to be created. The new packaging lets the user feel the brush hair, creating a personal connection via touch, it also shows the new metal band with the embossed logo and the cuff method of fastening. On the front package there will be a clear illustration of what this brush is meant to be used on, and what quality tier it belongs to. Whenever possible the premium quality tiers will be available with both wooden and plastic handles as it is a highly personal thing what type of handle you prefer. The design guidelines coupled with the new portfolio strategy create a clear and coherent look for Mäster’s products, which will help customers navigate more easily, and make the brand a more attractive purchase when in the store. The new portfolio will ensure that Mäster can offer something to all types of painters, and that the values of the brand are shown in their products.